This puzzle is built on a 4 sided hexagonal enneaflexagon, with 6 triangles and 3 kites per face. It's shaped like a hexagon, but is different from the hexaflexagon made from equilateral triangles. 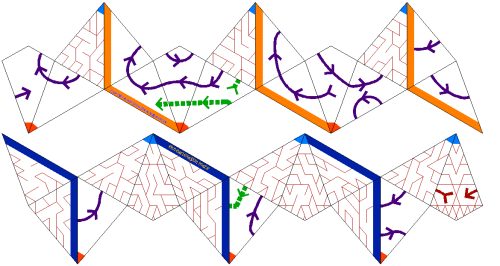 The triangles and kites follow this sequence when flexed. Use the pinch flex to travel between these arrangements. The simplest maze is the green path. It's designed to acquaint you with how to flex this puzzle. Start on the side with the green and purple paths, where you can see the first piece of the green path that's not connected to anything else as well as some later pieces of the green path. Pinch together the pairs of triangles on either side of the solid black lines. 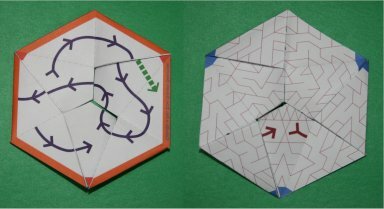 You should then be able to open up the center of the flexagon to reveal a side with blue borders. If you turn it over, you'll see that the green and purple paths have been rearranged. Now you can see that the first two pieces of the green path have been connected. The entire path won't be visible all at once, so this first step simply allows you to travel from the beginning of the green path to the second piece. You may want to mark the sections in pencil to keep track of which pieces you've visited. The next step is to flex back to the original position. Pinch together the leaves on either sides of the following black lines, then open up the center. Flip it over when you're done to see the original arrangement. You can now see that the second segment in the green path has connected to two more pieces. To finish the puzzle, turn it over to see the side with the blue dot in the middle. Flex along the solid black lines and open up the center. You should now see the previous segment connecting to the final arrowhead, finishing the maze. Those are the three positions of this flexagon. 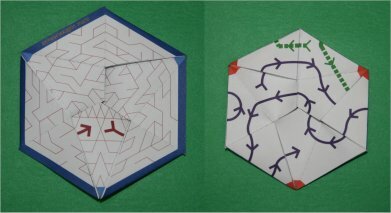 The purple maze can be solved in a similar fashion though it involves a few more flexes and it starts to show how the path of the maze can branch in unexpected ways. If you watch closely, you can see how the kites are always visible as you flex. 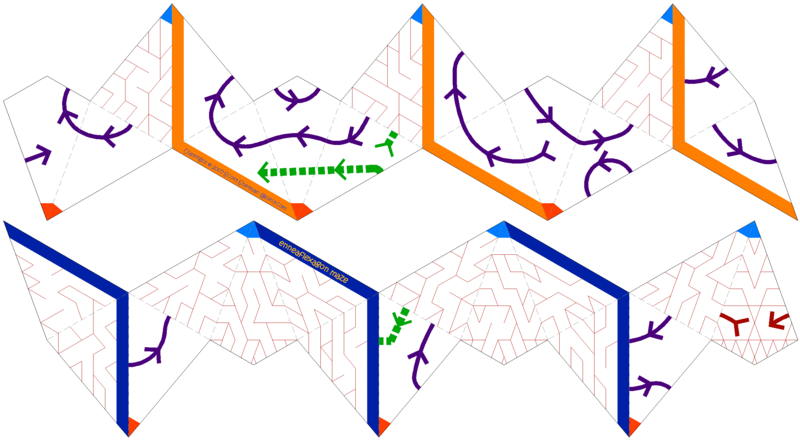 They just change orientation, allowing a shared area for the maze as the triangles swap in and out during flexing. 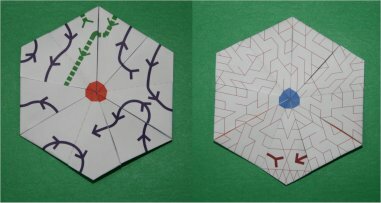 Once you've mastered the purple maze, you can try to solve the red maze on the other side of the flexagon.